Chicago, IL– The MAVBBL is proud to announce that several of its club executives were elected to the top posts of the Vintage Base Ball Association. Brad “Brooklyn” Shaw from the Neshanock was voted in as President and is the first sitting member of a MAVBBL club to be elected to such a high position. In addition, Matt Bartnicki from the Diamond State BBC of Delaware was named Vice President. Eric Micklich from the Eckford Club of Brooklyn was re-elected as historian. Brian Travers from the Providence Grays and Bruce Leith from the Eclipse BBC of Elkton still have 1 more year left on their terms as trustees. The 2016 season is still 4 months away, but on January 16, the MAVBBL will hold its annual President’s and Scheduling Meeting. The 2016 edition of the League looks to feature up to 24 clubs from Rhode Island to Washington DC and as far west as Harrisburg, PA.
Each year, the club presidents gather to discuss the previous season and look ahead to what can be done to improve the play of member clubs for the upcoming year. Loop holes are discussed as well as new research in to the history of the game that could alter the way member clubs have played. Each year, new language is found from the 1860s that member clubs didn’t know about. Sometimes, even new ways of play from pitching to hitting stance is introduced to make our game more authentic to spectators who come out and watch us in the upcoming year. For example, up until just a couple of years ago, clubs would exclaim “Huzzah” after matches. After research it was found that the correct language should be “Hurrah”. Words like “hurler”, “behind” and “cranks” have been eliminated from our vocabulary and replaced with “pitcher”, “catcher” and “spectators”. (Words that are common today and were actually used in the 1860s as well!). At the end of the meeting, in a scene that looks like its straight off the trading floors of Wall Street, everyone takes about a half hour to meet with other presidents to fill out their 2016 schedules. If you are interested in playing for one of our clubs or if you have an interest in starting your own club for the future, please contact us. We have a strong interest in placing clubs in Richmond and Fredericksburg, Virginia as well as Scranton, Allentown, Reading, Lancaster, and Gettysburg, Pennsylvania. Posted on Monday, August 10th, 2015 and is filed under WNY Sports. MUMFORD, N.Y. — Run differential determined the contestants. Defense decided the outcome. 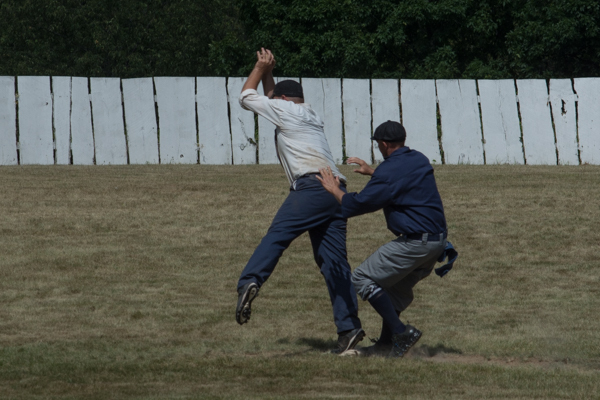 “Black Bart” made a sliding catch in foul territory to secure the final hand down as the Mid-Atlantic BBC defeated the Cleveland Blues, 4-3 in the finals of the 2015 National Silver Ball Tournament played on the Silver Base Ball Park at Genesee-Country Museum, Sunday afternoon. Mid-Atlantic took the lead in top half of the inning when the club nine’s hurler, “Sledge” tallied the winning ace. With one hand down, “Sledge” made his first on a hit up the middle. After a stolen base, “Dream Bucket” made his first with a hit to right center allowing “Sledge” to cross the dish. But this game was a battle of two teams intending to show a little a ginger in the field. “Black Bart” made four straight put outs and six of seven between the second and fourth innings. The Mid-Atlantic left fielder made three consecutive catches in left field after Cleveland’s first two striker’s in the third made their first. “Moonlight” added to the Mid-Atlantic defensive display with a spectacular catch in center field for the first hand down on the fifth. The Blues were not to be outdone in the field. Trailing 2-0 with the sacks loaded, Cleveland’s hurler, “Plow,” delighted the cranks when he snared a stinger at the mound and threw to first for an inning-ending double play. Mid-Atlantic took an early lead. “Sledge” made his first and stole second and third before tallying the match’s first ace when “Dream Bucket” reached. After “Moonlight” made his first, “Dream Bucket” tallied the second ace when “Doc” made his first. Both teams were whitewashed until the bottom of the fifth. With one hand down, “Duke” made his first. The left-handed hitting “Plow” used an inside-out swing to make his first on a hit down the third-base line. “Meal Ticket” reached and “Duke” tallied on a muff. “Plow” tied the game at two, but the inning ended when “Moonlight” made a throw from center field to get “Meal Ticket” at the dish. “Pins” gave Mid Atlantic a 3-2 lead when he tallied an ace in the seventh. “Stump” tallied as Cleveland knotted the score at three in the eighth. 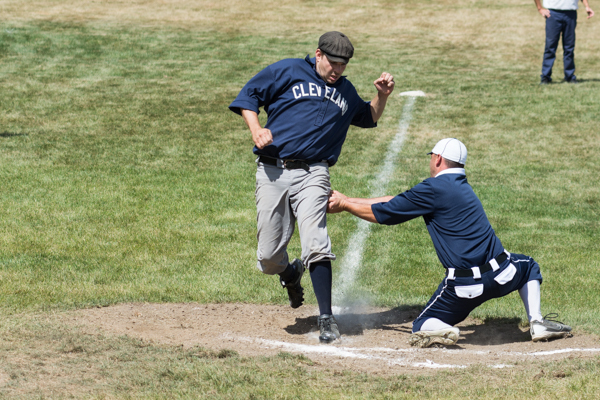 Cleveland and Mid Atlantic were two of four teams to finish the round-robin portion of the tournament without a loss. Cleveland tallied 68 aces in their first four matches. Mid Atlantic had 70. The Mid-Atlantic team was assembled just weeks prior to the tournament when another organization withdrew from the competition. Mid-Atlantic consisted of players from several different clubs along the east coast. “One Side” made his first as four of the first five Akron strikers reached in a decisive five-ace seventh. Spring Creek tallied five aces in the eighth and three in the ninth for the come-from-behind win. Woodstock erased a two-run deficit with five aces in the sixth. Rochester took a 5-1 lead in the third. “Meat Cleaver” made his third to start the stanza. “Piano Man” and Angel made first to bring home aces, but Woodstock stopped the rally with a double play. Cleveland put crooked numbers on the board in three of the first four innings to take a 15-0 lead. Rochester showed a little ginger in the eighth. “Stubby” made his second to start the inning and scored the club nine’s first ace of the game when “Meat Cleaver” made his first. Gettysburg, PA– A driving thunderstorm right before the 6th Annual Gettysburg National 19th Century Base Ball Festival nor the searing heat could keep the thousands of fans away as 18 clubs converged on Gettysburg on July 18 and 19. The setting was once again at the Schroeders Farm just minutes from the Peach Orchard and the day 2 battlefields. Fans were not disappointed as some of the best matches in the history of the festival took place. 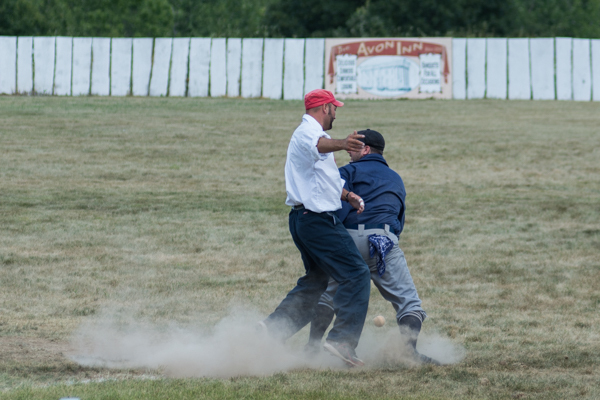 Many clubs from the MAVBBL joined the Tennessee Hog and Hominy Club, the Columbus Capitals, the Spring Creek Nine and the Maine Dirigo club for an epic weekend of base ball and friendship. Some of the highlighted games included a 1-1 11 inning battle between the Eckfords and the Fair Plays. The Eckfords also lost a 8-7 squeeker at the end to the Elkton Eclipse. The Eclipse also gave up 2 runs in the top on the 9th but scored 3 in the bottom frame to down the Dirigo Club from Maine. Maine also lost a heartbreaker to the Atlantics 11-10 in the same fashion. It was once again a great event and look for the 7th one to take place the 3rd weekend in July. We hope to see you there! Ronks, PA- The Mohican Base Ball Club of Kennett Square became the first club outside of the Elkton Eclipse to win the Strasburg Rail Road Tournament on Saturday, May 16. On a warm, muggy day in Lancaster County 4 clubs, the Mohicans, the Eclipse BBC of Elkton, the Minvera BBC of Bridgeton, and the Rising Sun BBC took the field after riding the rails of the Strasburg Rail Road to the Verdant Farm. In the first match, Kennett Square got by the Rising Sun Club 11-9 although Rising Sun put up a fight and scored 4 late but couldn’t plate the other 2 runs necessary for the tie. In the other semi final, the Eclipse played the Minvera for the first time ever and came away with a 23-2 win setting up a show down with Kennett. In the championship, it was a low scoring affair in the beginning of the game and after 5 innings it was 3-2 but then the Mohican pulled away at the end winning their first Strasburg Bat 13-5. In the 3rd place game, Rising Sun downed Bridgeton. The next Strasburg Rail Road Tournament will be in October as 6 clubs compete for the coveted trophy bat. Those 6 include: the Keystone BBC of Harrisburg, the Excelsior BBC of Milford, the Bog Iron Boys of Allaire Village, the Flemington Neshanock, the Rising Sun BBC and the Elkton Eclipse.